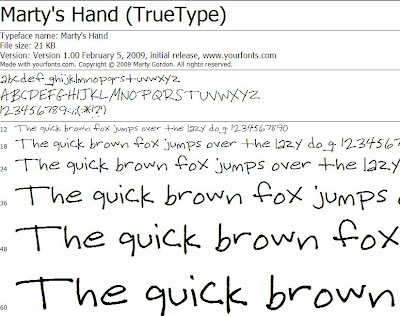 I just created a font of my handwriting at Your Fonts. I've always wanted to design fonts but didn't know how. Now it's very simple. I'm sure I'll be designing some more when I have the time. For now, I'll just have to be satisfied with Marty's Hand. Looking at this, I can't tell whether my handwriting is cool or just weird. What do you think? I just discovered this site last week and I've been aching to try it out. It looks like it works pretty good, eh? Send me a copy of your font... I'll add "Marty's Hand" to my design arsenal!